Dark Messiah: Might and Magic has finally arrived on consoles. Well, on a console, but nevermind. The point is that it’s here and new and improved. 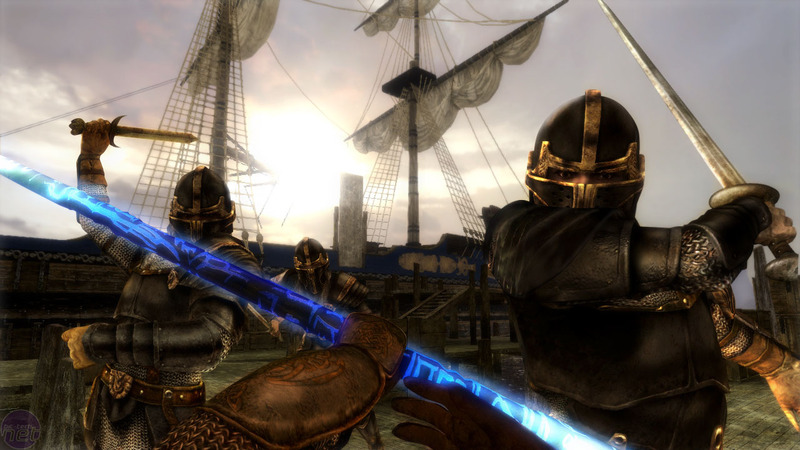 The original PC version of Dark Messiah, as it is more commonly known as nobody can ever be bothered to say the whole thing let alone with the spurious Elements added on the end, was released back in October 2006 and was one of the first third-party games to see a widely anticipated release on Valve’s Steam platform. As with most hyped game releases, reaction to Dark Messiah was very mixed. Some people loved the FPS and RPG-lite hybrid, praising the integration of physics and deep combat. Others however got bogged down in the numerous problems with the initial releases – audio static, bugs, crashes and slow downloads. It was a shame really because, to me, Dark Messiah was a rather excellent game and very deserving of the praise it was actually struggling to receive. So, when I saw the game on show at Ubidays 2007, I was naturally excited for the chance to play through an expanded and enhanced version – even if it was on a console. If you never got around to playing the original FPS/RPG hybrid on the PC, then allow me to summarise it briefly. Since this is a port of that game you’ll need at least a basic understanding of the original to see where most of our comparisons are coming from. The bulk of the backstory is given in the introduction to the game and involves the banishment of all the demons in the world to a extra-dimensional prison by a great sorcerer. The lord of the demons, who is stereotypically fiery and malevolent, was wily enough to have a trick up his sleeve and begat a series of heirs in our world which, according to an ancient prophecy, may someday free him and his kind. The titular Dark Messiah. Enter the player character then, young Sareth. An orphan and apprentice hero under the tutelage of the wizard Phenrig, Sareth is ordered off on a mission to retrieve a sacred artefact of unimaginable power—the Skull of Shadows—as the prophecy enters the time of fulfilment. Sareth is typically naïve and unknowing and blunders through his quest. He battles orcs and necromancers, learns more about himself through Xana, his guardian spirit, and is ultimately made to choose a future for his world via a number of different endings. In other words; swordey man goes on a quest, swordey man kills things. It wasn’t massively clever, but the game bundled together a whole bunch of neat and, at the time, cutting-edge and uber-fashionable things to spice itself up. HDR, different character upgrade paths, multiple endings, the Source engine – these were all there. The big addition though was physics as the game heavily used the power of Havok – you could kick enemies, knock them down, unleash physics traps and all of it was done without a single see-saw puzzle. Dark Messiah: Elements expands on these core appeals that the original had, keeping all the fun goblin-kicking goodness and bringing… well, what exactly does Elements bring to the mix? Changes, that’s what. Big ones. Huge ones that surprisingly don’t ruin the gameplay as much as you’d expect. But be warned: if you were a massive fan of the original game and you’re hoping for more of the same but with more levels then you may go away a little irate. While there certainly are more levels, some of them are just recycled from the original and the numerous gameplay changes—such as the now much more linear class system—may put you off. Dark Souls II is a superb if slightly safe addition to the hack and slash RPG franchise. Sony has explained why ports of classic PSone games take so long to see release. Zenimax Media has acquired Arkane Studios.